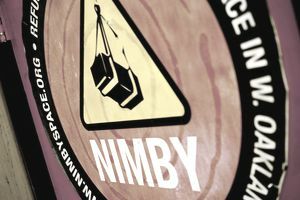 NIMBY is an acronym that stands for not in my backyard. It is used when citizens oppose a public works project or private development primarily because it will be built near where they live. These citizens often see the need for the project or development but oppose it because of the negative impact on them. A NIMBY attitude can be incredibly frustrating for local officials. Public works projects are necessary expenditures for local government, and they are needed to improve the quality of life in a community. Highway expansions, prisons, power plants, sewage treatment plants, and landfills are public works projects that frequently draw NIMBY opposition. Private developments — which local governments have some regulatory authority over — are a fact of life in a growing community. Economic development directors spend their working hours attracting businesses to their communities, but their efforts can be thwarted by well-organized and vocal NIMBY types. Elected officials like city council members pay attention to well-organized and vocal groups, so public administrators must be ready to respond to issues raised. New neighborhoods, low-income housing developments, shopping centers, stadiums, and amusement parks tend to garner NIMBY detractors. Unfortunately, the positive and negative impacts of public works projects and private developments fall unevenly across citizens. Almost everyone can get behind building a new prison when current ones are overcrowded to the point of human rights concerns, but no one wants to live next to a prison. Ninety-nine percent of the voters may be for construction, but the people who own property adjacent to the proposed site are vehemently opposed. Similarly, most people like the idea of a new shopping mall in town. However, few would want the parking lot on the other side of their back fence. NIMBY folks often give the impression they are against progress. While their propensity to use picket signs and chants comes off a little silly, the concerns they raise are important ones. They cite problems like traffic congestion, pollution, loud noise, increasing crime, decreasing real property value, harm to local business and loss of local character. Those who do not live near the proposed project or development may write off many of these concerns as implementation issues, but then again, those dismissing the concerns do not have to live next to the site. Mitigating the concerns rarely means problems will be avoided completely. Here are a few examples showing how NIMBY sentiments can impact real life. In 2010 in Austin, Texas, Wal-Mart proposed to renovate the site of the closed Northcross Mall to open a store there. In a town known for hippies, liberals and development opponents, this part of town had a relatively high concentration of all these individuals. A group of neighborhood residents organized to fight the renovation. Some people opposed Wal-Mart because of its employment practices, so their issues with the development were on a larger scale than NIMBY concerns. Others opposed the development because of the potential impact on local business, traffic flow, and crime. In the end, Wal-Mart renovated the site, but the store was built smaller than originally proposed. The group Responsible Growth for Northcross fought the development for more than four years with their chief arguments as NIMBY issues. In recent years in Western Europe, the placement of wind farms has been a hot issue with NIMBY implications. The countryside is the ideal place to build wind farms since there are few large structures to block the wind. The problem comes when an actual site is proposed. People are happy to reduce their nation’s dependency on fossil fuels when it makes economic sense, but many rural residents do not want windmills added to the views from their bedroom windows. The NIMBY argument is the windmills mar the picturesque landscape.